It takes a special kind of person to create poetry for young children. The poems cannot be too long, they have to be engaging, and they have to be about subjects that will resonate with the audience. In today's review title the poet manages to do all these things and more. Poems come in all kinds of flavors. Some are deep and meaningful, some tell a story, and some were created to make readers laugh. This title is just such a rib-tickling book. The author writes about situations that children will appreciate, adding in plenty of child-friendly humor. For example, in It’s not fair, we meet a boy who is mighty peeved because when he burps he is scolded, whereas when babies burp the grownups shout “Hooray.” Clearly there is something about this state of affairs that simply is not right. Then we meet a little boy who has a wiggly tooth and who wants his friend to help him get it out. She suggests that “he bite jawbreakers / or chew on an old shoe,” or she could make him “loose-tooth juice / with crunchy rocks and glue.” Whatever the children do, the little girl isn’t too worried because she knows that she has a secret weapon that is sure to do the trick and get the tooth on the move. With funny illustrations and sturdy coated pages, this splendid book is perfect for little children who like to explore language and who enjoy a good laugh. August 28th is the anniversary of the day when Martin Luther King Jr. gave his 1963 "I have a Dream..." speech in Washington D.C. He was supported on this day by many speakers, leaders, and singers. One of the people who stood at his side then, and on other occasions, was a woman whose voice could make people smile and weep. her name was Mahalia Jackson. Today's picture book tells the story of the connection and friendship that grew between Martin Luther King Jr. and Mahalia Jackson. We see how both of them raised their voices to encourage people to have hope, to stand tall, and to peacefully fight for equality. In two cities in the south, there were two children who learn how to use their voices to reach out to their people. In Atlanta, Georgia, young Martin Luther King Jr. learned how to deliver sermons in church, captivating his listeners with his “Gift for gospel.” In another church in New Orleans, Louisiana, Mahalia Jackson sang in the choir and everyone could see that she had a gift for gospel: sung gospel. As Martin and Mahalia grew up their gift for gospel grew with them. People came to hear Martin’s sermons, to be strengthened by his words of hope. People also came to hear Mahalia sing and they bought her records. White people and black alike loved her voice, which was “Brass and Butter. Strong and smooth at the same time.” Both Martin and Mahalia wanted to “set people on the path to peace,” they wanted people to hope that one day all people, white and black, would be free. The two admired each other a great deal and then in 1955, during the Montgomery Bus Boycott, they came together to preach and sing their support for the cause. This collaboration was just the beginning. They wanted to do more and both decided that they would take part in the March on Washington for Jobs and Freedom. Here was an opportunity for Martin and Mahalia to reach out to thousands of people. After Mahalia sang to quieten the crowd, Martin began speaking and his friend encouraged him to speak on. “Tell them about your dream, Martin!” she said. And so he did. The lyrical text is paired with beautifully expressive artwork, and at the back of the book readers will find out more information about Martin and Mahalia, a note from the illustrator about “Painting Parallels,” and a combined timeline of Martin and Mahalia’s lives. I have lots of books on my shelves about the many different poetry forms that poets like to use. It is interesting to see how words can be used to create different moods and effects. Today's poetry title is special because it brings together lots of different poetry forms so that children can explore them with both their eyes and their ears. If you think that poetry is strictly for learned professors and students of English Literature you are about to discover that you couldn’t be further from the truth. Poetry is all around us and we begin to hear it and enjoy it from our very earliest days in this world. In the nursery we listen to Twinkle Twinkle Little Star and other nursery rhymes and then we move on, as we grow, to more complex poetry forms such as nonsense verse, limericks, haiku, narrative verse, and lyric verse. With plenty of examples to show us what he means, the author introduces us to the major poetry forms. He also gives us a lot of information about the historical and cultural significance of many of the sample poems. As we read we are encouraged to listen to the poems on the CD provided. Many of the poems will be old friends like The Jabberwocky, Paul Revere’s Ride, and The Road Not Taken, while many others will be new and beautiful pieces to listen to and explore. In the second half of the book the author introduces us to some of the greatest poets of all time. From Homer to Robert Frost and from Shakespeare to Langston Hughes, this will be a fascinating journey both from a historical and a poetical point of view. This volume is practically a complete poetry course in one book. It presents poetry in a fresh and exciting way, helping the reader to see and appreciate that poetry gives us a wonderful way to tell a story, to express a feeling, or to make a person laugh. Michael Driscoll is a creative and inspired writer who knows how to make the study of literature both interesting and entertaining. I have a soft spot for stuffed animals, which is why I was drawn to today's picture book. The characters are all stuffed and felted animals that have been placed in cleverly crafted scenes and photographed. As I read the tale I quite fell in love with the characters and admired their courage and ingenuity. How wonderful it is that we now have more stuffed animal book heroes to enjoy. I am sure Winne-the-Pooh would approve. Benjamin Middlemouse lives with his mother in a bedroom wardrobe in an old house. One day, Mrs. Middlemouse goes out to run some errands. 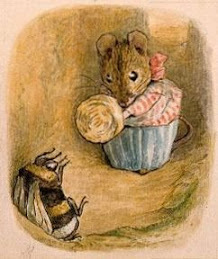 She tells her son that she will be back by three o’clock, but at three o’clock there is no sign of Mrs. Middlemouse. Four o’clock ticks by and it becomes clear that something has happened to Benjamin’s mother. Benjamin climbs out of his wardrobe home and goes to talk to Bumper, his elephant friend. He tells Bumper that Mrs. Middlemouse is missing. Without hesitation, Bumper says that he will help Benjamin look for his mother. The friends collect supplies and Benjamin piles them onto Bumper’s wide back. Cautiously Bumper and Benjamin go to the kitchen. There is no sign of Mrs. Middlemouse, so Bumper asks the Pantrymice if they have seen her. Posie Pantrymouse says that they saw Benjamin’s mother just a short while ago. Apparently she was on her way to the garden to get a tomato. The problem is that Sir Pouncelot is on the prowl in the garden looking for the ingredients he needs to make his favorite dish – mouse and mole casserole. Mrs. Middlemouse is in grave danger! Benjamin and Bumper hop on their home made scooter and out into the garden they go. There they find Mrs. Middlemouse’s errand list, and they pick up her scent. Unfortunately they also pick up the scent of Sir Pouncelot. In this wonderful picture book the author takes her readers on a grand adventure. For the artwork Molly Coxe created beautiful animals out of felt and fabric and they have been placed in a lovely world. Readers will have a grand time exploring the scenes in the photos, and identifying the things that the mice have ‘borrowed’ from humans to make their lives easier. When I was in elementary school I had a teacher who loved humorous poetry. Among other things, this teacher introduced me and my classmates to Edward Lear's limericks. We had many laughter-filled lessons exploring these wonderful little poems, many of which we memorized. Most people have, at some point of another, encountered Edward Lear’s wonderful poems and limericks. So many of his poems are memorable because they are delightfully peculiar and often funny. The strange thing is that Edward Lear was a sad person much of the time. He was only really happy when he was creating art or writing. Though he did make friends, he never married and was often lonely. As so often is the case with lonely people, Lear was very fond of children and animals. He enjoyed creating stories and pictures about animals that children found entertaining. His first collection of poetry, A Book of Nonsense, contained artwork and poems that he had written for some children whom he befriended. In this excellent poetry picture book readers will encounter a wide variety of poems that Edward Lear wrote. Some will be familiar like The Owl and the Pussycat, The Jumblies and Calico Pie, while others will be new to the reader. What makes this collection special is that the editor provides readers with an introduction about Lear’s life and work at the beginning of the book, and every poem is prefaced by a note that gives readers further information about that poem. Thus every poem is given a context that helps us to better understand what Edward Lear was trying to achieve when he wrote the piece. Though many of the poems are nonsensical, they do have underlying themes that are serious in nature. The famous poem, The Owl and the Pussycat is about an owl and a cat who, despite their differences, want to be a couple, so they “sailed away, for a year and a day,” to an island where they were married and the poem ends on such a happy note that we are sure that they will find happiness. In The Scroobious Pip, we meet a creature that is not a mammal, a bird, a fish, or any other kind of recognizable animal. The other animals are troubled by this and they appoint some of their number to ask the Scroobious Pip “Are you Beast, or Insect, Bird or Fish?” Some creatures would develop a complex being asked this question so many times, but the Scroobius Pip does not allow himself to be perturbed. He is content being who and what he is. Throughout the book the editor also provides us with definitions of some of the words used in the poems. This feature will certainly help readers to appreciate the poems fully. After all, many of us have no idea what a “snuffer” or “Stilton Cheese” is. Every so often I come across a picture book that makes a deep impression on me. Today's review title is just such a book. The beautifully crafted text is perfectly married to gorgeous artwork that is both sweet and powerful. On a bright sun-drenched August day Miss Maple comes flying home on the back of a little blue bird. Soon more blue birds arrive and each one is carrying a basket on its back. In the baskets, nestled in soft beds of grass, are the seeds Miss Maple has been collecting all summer. These seeds are the ones that “got lost during the spring planting.” Miss Maple is going to care for these seeds in her maple tree home and get them ready for the planting season in the coming year. Miss Maple carefully washes each seed, saying “Take care, my little ones, for the world is big and you are small.” While the weather is still fair, Miss Maple takes her charges on field trips so that they will learn what it means to be a seed. She shows them the river that may carry them to their new home. She travels on the wind to show them the fields and forests. In this special picture book beautiful artwork is paired with a lyrical text to tell the story of a little lady who appreciates the potential the lies in the seeds she cares for. She knows that each seed, no matter how small it is, has within it the ability to travel far and to do great things. Children and grownups alike are going to love this gentle and meaningful tale. I am not afraid to admit that I am a art supply junkie. I love browsing in art supply stores and have a rather large collection of paints, pencils, pens, and crayons, which is why I loved this picture book. Imagine what your art supplies would say to you if they could speak, or write. I know my paint brushes would complain about the fact that I keep absentmindedly dipping them in my tea. The orange and yellow crayons are not on speaking terms so they voice their complaints through their letters to Duncan. The white crayon is tired of being used to color white paper, and the pink crayon is upset the Duncan hardly ever uses it. Of course Duncan had no idea that his crayons were so upset and now he has to find a way to reassure and placate them. Readers of all ages are going to enjoy this enormously amusing picture book. Everyone has, at some point, used crayons to draw and write. There is something comforting about their colors, their texture, even their wonderful crayony smell. Who knew that they all had such different personalities and problems! With wonderful artwork and a truly unique story, this picture book is sure to become a favorite in homes, classrooms, and libraries. The first Mother Goose book containing nursery rhymes was published by John Newbery in 1791. Since then dozens of Mother Goose books have been published in many languages, and many have been created using unusual formats. What I like about today's poetry title are the cunning and richly detailed illustrations that Sylvia Long has created to accompany the Mother Goose rhymes. Let us go on a trip down lanes peopled with animals in cunning old-fashioned outfits. Let's encounter rhymes that are old friends, and ones that will become new friends. Though the rhymes are in their original form, the illustrations are full of surprises. The reader will find that the illustrator has put her own personal twist to these old, much beloved, rhymes. Instead of having poor Humpty Dumpty break open, Sylvia Long has the egg fall of the wall, crack, and reveal a little duckling that is inside the egg. In "Hey Diddle Diddle" the cow, dressed in a tutu and ballet slippers, leaps gracefully over the moon, and a spoonbill bird is the one who runs away with the dish - who just happens to be a turtle. In addition to many of the more familiar Mother Goose rhymes, Sylvia Long has added some of the less well knows rhymes to her beautifully illustrated collection. It is a treat to be able to enjoy these rhymes, to laugh at the funny things that happen to the characters in them, and to indulge in this wonderful literary legacy that belongs to us all.